New release! For 10-16 players, ages 16 to adult for horror content and difficulty. If you want a night of doom, despair, murder & mystery, this game is for you. 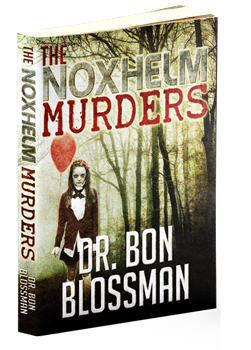 This spooky game is inspired by the award-winning YA horror/mystery novel, The Noxhelm Murders, by Dr. Bon Blossman. This is the instant download upon purchase - no waiting, no shipping fees. Everything you'll need to play is included in the download, and nothing needs to be shipped. Want a boxed set? No worries, click on the link below to have us prepare your kit. Note: there are two victims in this game. Click here to view the 8 character expansion pack#2 - expansion packs must be played in order. In a quiet, foggy town in an unassuming neighborhood known as Misty Oaks, there is a sinister force lurking within the walls of what the town calls Ripper House. Built on an ancient burial ground in the 1920’s by The Butcher of Noxhelm, the house has claimed over a hundred lives with some of the bodies said to have been buried in the crawl spaces. Visitors claim to have witnessed lights flickering, doors slamming, and other paranormal incidents. It is well documented in history that whoever owns the home will be dealt a hefty case of doom and despair with a twist of death and destruction. Ben and Brenda Biggs are the new homeowners of 203 Moorgate Street, and have invited the neighborhood over for a housewarming party. They seem like a nice couple, which is such a shame. You were invited. This is where your story begins. This totals 62+ players for the guest lists, including 32 unique character roles and 30 additional team players. 16 years for horror content (ghosts/paranormal, murder) and difficulty. This game was so much fun and the it had a great twist, that none of us saw coming.